Colin has many years of experience with a combination of education and on-the-job training, including a degree in Architecture from Drury University and many years’ experience managing all phases of large scale commercial and industrial remodels and new construction. He is also experienced in budget analysis, estimating, scheduling, cost analysis, bid analysis, general supervision, overall project coordination, and contract analysis. Colin’s project positions have included various management and superintendent roles on the many projects in his portfolio. His certifications include OSHA accreditation. 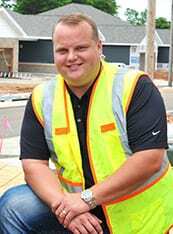 Colin’s responsibilities include project managing and estimating, bid analysis, contracts, scheduling, cost management and general supervision of construction personnel on our projects covering a two-state region of Missouri and Oklahoma.